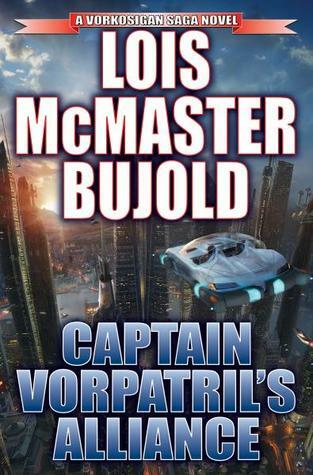 Lois McMaster Bujold is back in the saddle again. In CAPTAIN VORPATRIL’S ALLIANCE, the fifteenth volume of Bujold’s saga about the family and friends of Miles Naismith Vorkosigan, we get a chance to spend a goodly amount of time with Miles’s cousin Ivan — the titular Captain Vorpatril — and the unusual galactic woman he marries, Akuti Tejaswini Jyoti ghem Estif Arqua (called “Tej” for short). This isn’t your ordinary Vorkosigan novel, especially as Ivan is known mostly for his conflict avoidance and for his lack of brilliance compared to his genius biological cousin Miles and his genius cloned cousin Mark. Ivan meets up with Tej on the domed planet of Komarr, one of the Barrayaran Imperium’s three planets, after his disreputable relation Byerly Vorrutyer points Ivan in Tej’s direction. By, you see, is known to Ivan as an operative of Imperial Security — otherwise known as a spy to you and me — and By’s come calling in his professional capacity. By believes that Ivan is Tej’s only hope; even though By doesn’t know Tej’s real name and doesn’t know Tej’s real circumstances, either, By actually is proven right with this snap judgment. Ivan meets up with Tej, who he believes is called “Nanja” and is supposedly a Komarran citizen, at the place where she works — a rather small, dingy ceramics shop. He buys an ugly vase for his cousin Miles, attempts to make small talk, then tries to pick her up . . . and can’t do it. But that’s not what happens at all. Instead, Tej and her “odd sister,” the blue-skinned, rather exotic Rish, end up stunning Ivan and dragging him up to their small apartment. This, of course, is a mighty come-down for Ivan as he’s known for his remarkable prowess at womanizing. Then he gets tied to a chair and left; they go away, presumably to sleep and deal with the problem of Ivan in the morning. However, some thugs try to break into Tej’s apartment. Ivan, who’s no fool even when tied to a chair, talks loudly enough to wake the women. They stun the men, untie Ivan, and go back to Ivan’s apartment as it’s the safest place any of them can think of to be . . . then Ivan goes to work as he doesn’t want to admit any of the last several hours’ worth of events have happened. All of this, thus far, is farcical and is played that way on purpose. But things take a darker turn soon enough, as Tej admits to Ivan what’s been going on; her family’s been eliminated in a Jacksonian shakeup, and she and Rish are on the run. Ivan hides Tej and Rish, then By comes calling again, this time only a bare handful of minutes before the Komarran police show up (as they believe Ivan has kidnapped or perhaps even murdered “Nanja,” whom they know as a Komarran national due to Tej’s excellent false identification). None of this is a spoiler as it all comes from the sample chapters Baen Books put up at their own Web site. How are Ivan and Tej to get untangled after this knotty start? Well, a lot has to do with the nature of Ivan’s job as aide-de-camp to Admiral Desplains; that Ivan has finally married, much less to such an interesting galactic woman, has intrigued the Admiral, who does his best to facilitate a happy outcome (at least for the time he’s involved in the book). Next, Ivan’s mother, the formidable Lady Alys Vorpatril, and his quasi-stepfather, the even more formidable Simon Illyan (the former head of ImpSec), do their best to point out that Ivan and Tej are perfect for one another; both are quietly intelligent, capable people who’ve been overshadowed by most of their relatives for most of their lives, but see the value in each other and start to gradually build a life together. However, then a major plot wrinkle shows up — which I refuse to spoil — and this throws a monkey wrench into Ivan’s marriage. So will these two end up together? Or won’t they? And how does the sinking of the Imperial Security Headquarters building play into it all? Bottom line: this is a good and involving romance with many farcical turns and a few, surprisingly revealing emotional episodes involving Ivan, his mother Alys, and his new wife, Tej. Ivan’s a solid character, and Tej’s insights into Barrayar (coming to it as a galactic citizen, as did Miles’s mother Cordelia Naismith before her) are interesting, too. This entry was posted on November 24, 2012, 11:59 pm and is filed under Book Review. You can follow any responses to this entry through RSS 2.0. You can leave a response, or trackback from your own site.